← The calf has arrived! 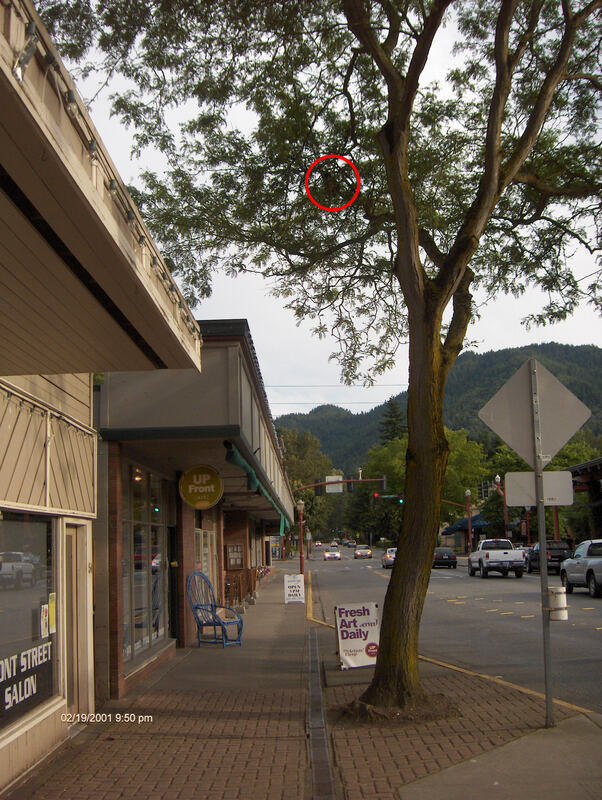 This swarm is on crossed branches 20 ft. above a busy sidewalk in Issaquah, WA. Yesterday was beautiful, and my cubicle job gave me a rare chance to spend the afternoon outside visiting a cell site. After stopping at home for some supplies and dinner (It’s good Kathy feeds me when I’m thinking about other things–smart woman! ), I left for Issaquah with my two girls (age 3 & 9) to see what the swarm was like. 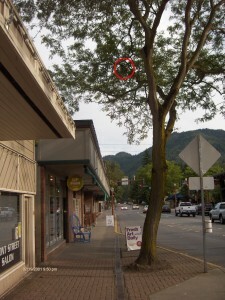 The bees had chosen a branch on a tall black locust tree 20 feet above a busy sidewalk in downtown Issaquah. Hmmmm….. I spoke with one of the shops for the building owner’s phone number, and I left a message asking permission for me to go up on the roof. Somehow, in spite of Monica’s warning, I had left the ladder at home. The missing ladder sealed it–I decided it would be too difficult and returned home; but still wondered if I could reach the swarm the nearby roof. The owner did give me the okay to go on the roof, and I returned later in the evening as the sun was going down with a large insect net on the end of a long pole. I’m glad I set up a bunch of orange warning cones on the sidewalk below, because only a portion of the bees went into the net. The rest went *splat* on the sidewalk, and I spent the next hour coaxing the remaining bees into my swarm catching box while talking with the bartender from across the street who came out to see my project. I’m counting this collection in the success column, although I’ll have second thoughts about proceeding next time the swarm is in a busy public location. I’m glad it wasn’t rush hour! This entry was posted in Beekeeping and tagged Beekeeping, Swarm catching. Bookmark the permalink.